The third release in this series, the MXS-EXP is destined to become a 3D legend! The MXS is rock solid in slow, high alpha attitudes, while the ultra-aggressive pitch and yaw rates generated by the massive EXP style control surfaces provide for the most insane gyroscopic tumbling maneuvers you're likely to experience. 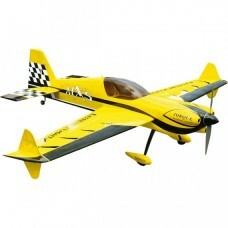 Tone down your rates and the MXS-EXP will hang with the best when performing precision aerobatic figures. The MXS-EXP is available in 2 beautiful Ultracote finishes with matching painted cowls, canopy/hatches and wheel pants over a jig-built interlocking laser cut structure that is light, robust and accurate. The carbon fiber wing tube, landing gear and tailwheel assembly are durable and lightweight and the dual ball link pushrod assemblies allow for precise control surface actuation. If you are ready for the state-of-the-art in high performance aerobatic aircraft design and performance then the 64" MXS-EXP is the airframe for you! Paired with the Torque Revolution 4016T/500 MKII! Featuring more efficient operation, better cooling, now magnet retention system, the capability to turn 16 inch props and MORE POWER, this new motor is perfect for all of the Extreme Flight 60 inch aircraft! Wing Area: 752 sq. in.